Welcome to the wasm-pack docs! First you'll want to install the wasm-pack CLI, and wasm-pack -V should print the version that you just installed. Next, since wasm-pack is a build tool, you'll want to make sure you have Rust installed. Make sure rustc -V prints out at least 1.30.0. Finally, if you're using wasm-pack to publish to NPM, you'll want to install and configure npm. In the future, we intend to rewrite the npm registry client bits so that the need for a Node runtime is eliminated. If you're excited about that work- you should reach out to the maintainers and get involved! Using a non-rustup setup? Learn how to configure it for wasm-pack here. Currently, wasm-pack requires that you have npm installed to pack and publish your package. Longterm, this will be replaced by a Rust only version. If you would rather use another package manager that interfaces with the npm registry you may, however, the pack, publish, and login commands wrap the npm CLI interface and as a result require that npm be installed. You can install npm by following these instructions. Part of the wasm-pack workflow is to publish your package to the npm Registry. Regardless of which package manager CLI tool you prefer, if you wish to publish your package to the npm registry you'll need an npm account. You can find information about signing up for npm here. wasm-pack compiles your code using the wasm32-unknown-unknown target. wasm-pack will automatically add this target for Rustup setups if you don't already have it installed by doing rustup target add wasm32-unknown-unknown. However, if you're not using Rustup we won't be able to this automatically and you'll have to do this yourself. Disclaimer: This is not guaranteed to work for every setup. These instructions below are specific for setups that match the exact rustc release, which means that the downloaded wasm32 target can be incompatible. To manually add the wasm32-unknown-unknown target you will need to download it from the rust-lang website and put the contents in the correct folder. All the targets for all the different rustc versions are not presented in a human way on a website (yet) for you to just select the one you want and download it, one reason for this is that Rustup handles all of this for you and the packaging of targets was mainly built for tools. However, the following steps will walk through how to do this. First, check what version of rustc you're using by running rustc --version. This should display something like: rustc 1.33.0 (2aa4c46cf 2019-02-28). Then you need to download the correct wasm32 target for your rustc version. The rustc version is part of the url, which means for rustc 1.33.0 the url will look like this: https://static.rust-lang.org/dist/rust-std-1.33.0-wasm32-unknown-unknown.tar.gz. You should be able to download this either by doing wget https://static.rust-lang.org/dist/rust-std-1.33.0-wasm32-unknown-unknown.tar.gz or by just visiting the url in a web browser. After you have downloaded this tarball at a location of your choice, you should unpack it. This should result in a folder named rust-std-1.33.0-wasm32-unknown-unknown that contains some folders and files, but the interesting one is a folder called rust-std-wasm32-unknown-unknown which contains a lib and that should contain a rustlib folder and in that, a folder called wasm32-unknown-unknown. This is the folder we want to move. To know where we should move this wasm32-unknown-unknown folder we need to run rustc --print sysroot which should print a path that looks something like this (this will vary on different operating systems): /home/user/rust/rust-1.33.0-2019-02-28-2aa4c46cf. That folder should contain a lib folder that contains a rustlib folder. We should move the wasm32-unknown-unknown to this folder. On unix-like operating systems we can do that with the following command: mv rust-std-1.33.0-wasm32-unknown-unknown/rust-std-wasm32-unknown-unknown/lib/rustlib/wasm32-unknown-unknown /home/user/rust/rust-1.33.0-2019-02-28-2aa4c46cf/lib/rustlib/ and that should be it! This path should point to a directory that contains a Cargo.toml file. If no path is given, the build command will run in the current directory. By default, wasm-pack will generate a directory for it's build output called pkg. If you'd like to customize this you can use the --out-dir flag. The above command will put your build artifacts in a directory called out, instead of the default pkg. Flag --out-name sets the prefix for output file names. If not provided, package name is used instead. The build command accepts an optional profile argument: one of --dev, --profiling, or --release. If none is supplied, then --release is used. This controls whether debug assertions are enabled, debug info is generated, and which (if any) optimizations are enabled. --dev Yes Yes No Useful for development and debugging. --profiling No Yes Yes Useful when profiling and investigating performance issues. --release No No Yes Useful for shipping to production. The --dev profile will build the output package using cargo's default non-release profile. Building this way is faster but applies few optimizations to the output, and enables debug assertions and other runtime correctness checks. The --profiling and --release profiles use cargo's release profile, but the former enables debug info as well, which helps when investigating performance issues in a profiler. The exact meaning of the profile flags may evolve as the platform matures. The build command accepts a --target argument. This will customize the JS that is emitted and how the WebAssembly files are instantiated and loaded. For more documentation on the various strategies here, see the documentation on using the compiled output. not specified or bundler Bundler Outputs JS that is suitable for interoperation with a Bundler like Webpack. You'll import the JS and the module key is specified in package.json. sideEffects: false is by default. nodejs Node.js Outputs JS that uses CommonJS modules, for use with a require statement. main key in package.json. web Native in browser Outputs JS that can be natively imported as an ES module in a browser, but the WebAssembly must be manually instantiated and loaded. This command would create a package.json file for a package called @test/js-hello-world. For more information about scoping, you can refer to the npm documentation here. The build command accepts an optional --mode argument. no-install wasm-pack init implicitly and create wasm binding without installing wasm-bindgen. normal do all the stuffs of no-install with installed wasm-bindgen. The wasm-pack test command wraps the wasm-bindgen-test-runner CLI allowing you to run wasm tests in different browsers without needing to install the different webdrivers yourself. The wasm-pack test command can be given an optional path argument. This path should point to a directory that contains a Cargo.toml file. If no path is given, the test command will run in the current directory. The test command accepts an optional profile argument: --release. If none is supplied, then a debug test build will be used. Choose where to run your tests by passing in any combination of testing environment flags. --headless is useful for running browser tests in a headless browser as part of a CI process. The test command can pass extra options straight to cargo test even if they are not supported in wasm-pack. To use them you should add standalone -- argument at the very end of your command, and all the arguments you want to pass to cargo should go after. cargo test -h for a list of all options that you can pass through. When debugging a specific issue, you may find yourself wanting to run a subset of tests, instead of your entire suite of tests. # Run all tests in tests/diff_patch.rs that contain the word "replace"
The goal of this tutorial is to introduce you to the rust-webpack-template and the wasm-pack workflow by building the example app in the template. This tutorial is aimed at folks who are both beginners to WebAssembly and Rust- you don't need much Rust knowledge to complete this tutorial. Be sure to have read and followed the Prerequisites. 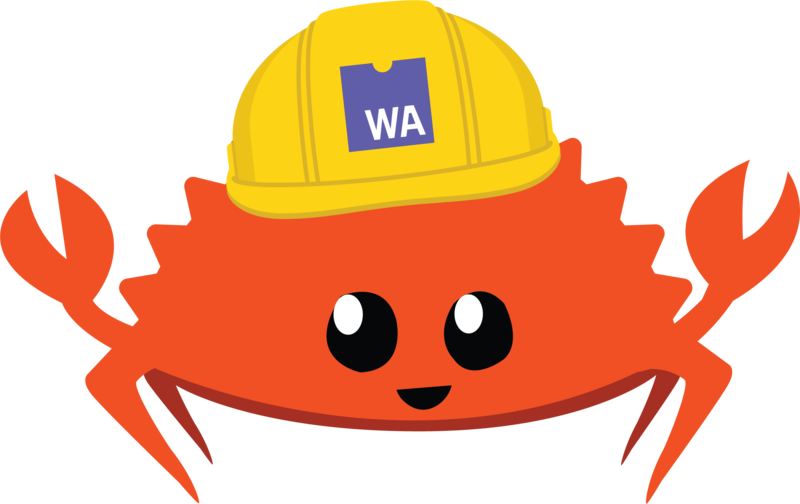 You can create a new Rust-WebAssembly webpack project by using the rustwasm webpack-template. The last argument will be your project name. After you run the command, you will have a directory with a new project, ready to go. We'll talk about what's been included in this template further in this guide. To generate a new Rust Webpack project, we've used the rust-webpack npm template. A new project folder will be created with the name you supply. README.md: the file you are reading now! crate/src/lib.rs: your Rust crate code! The scaffolded project includes an example Rust WebAssembly webpack crate. // Called by our JS entry point to run the example. Now, open up the js/index.js file. We see our Rust-generated wasm run function being called inside our JS file. Then in a web browser navigate to http://localhost:8080 and you should be greeted with text in the body of the page that says "Hello from Rust, WebAssembly, and Webpack!" If you did congrats! You've successfully used the rust-webpack template! The goal of this tutorial is to introduce you to the wasm-pack workflow by building a small npm package designed to be used in a browser application. Read and install the Prerequisites. ⚠️ We strongly recommend that you install Node.js using a version manager. You can learn more here. You can create a new Rust-WebAssembly project by using the rustwasm wasm-pack-template. You will be prompted to give your project a name. Once you do, you will have a directory with a new project, ready to go. We'll talk about what's been included in this template further in this guide. ⚠️ If you'd rather not use a template, or are having trouble with the template, you can do a manual setup by following these instructions. ⚠️ This is not the recommended way to start a wasm-pack project! If you ended up here by mistake, go check out our recommended project start. You can create a new Rust project named my-lib using this command. Next, add a [lib] section, with a new field named crate-type set to "cdylib". This specifies that the library is a C compatible dynamic library, which helps cargo pass the correct flags to the Rust compiler when targeting wasm32. description = "babby's first wasm package"
Step 3: Write some Rust! Now that your crate is correctly configured in your Cargo.toml file, the only step left to setup your project is to have some Rust code in your src/lib.rs file. And that's it! We'll talk about what this code does in the template deep dive, which you are all setup for now. Happy wasm-packing! ⚠️ This section is a deep dive into the contents of the files of a "Hello, World" project, specifically written for people who are not that familiar with Rust. If you'd rather just checkout the workflow, feel free to skip this section! ⚠️ If you haven't used a template to set up your project, the contents of your files may look slightly different than what is described here. Let's start by taking a look at what the template generated for us. Cargo.toml is the manifest file for Rust's package manager, cargo. This file contains metadata such as name, version, and dependencies for packages, which are call "crates" in Rust. A Rust-wasm crate is a bit different from a normal crate, and as a result, we need to note this in our Cargo.toml. This [lib] annotation is typically not needed in Cargo projects, and if you're familiar with other Rust crates you'll remember that the most common crate types are rlib (the default) or bin for binaries (which don't need a crate-type annotation). Here though crate-type = ["cdylib"] typically signifies that you'd like the compiler to create a dynamic system library, but for WebAssembly target it simply means "create a *.wasm file without a start function". On other platforms this output type will create *.so file on Linux, *.dylib on macOS, and *.dll Windows. We also specify crate-type = ["rlib"] to ensure that our library can be unit tested with wasm-pack test (which we'll see later). Without this we wouldn't be able to test our library because the cdylib crate type is incompatible with wasm-pack's style of unit tests. You can read more about linking and crate types, here. We'll see more about how to use this library when we discuss what has been generated in lib.rs. As part of our effort to design a template that helps people discover useful crates for their particular use case, this template includes two dependencies that can be very useful for folks developing Rust-wasm crates: console_error_panic_hook and wee_alloc. Because these dependencies are useful primarily in a specific portion of the Rust-wasm crate development workflow, we've also set up a bit of glue code that allows us to include them both as dependencies, but also allows them to be optionally included. In our code, we'll mark certain parts of code as running only if certain [features] are enabled, specifically, console_error_panic_hook and wee_alloc. By default, only console_error_panic_hook is enabled. To disable or enable either feature, by default, we can edit the default vector under [features]. To learn more about these features, we discuss them in-depth in the src/lib.rs and src/utils.rs sections. console_error_panic_hook for logging panic messages to the developer console. wee_alloc, an allocator optimized for small code size. lib.rs is the template's main source file. The name lib.rs commonly implies that this Rust project will be compiled as a library. We'll start with the most important part of lib.rs -- the two #[wasm_bindgen] functions (which you can find at the bottom of the file). In many cases, this is the only part of lib.rs you will need to modify. To expose functionality from the wasm-bindgen crate more conveniently we can use the use keyword. use allows us to conveniently refer to parts of a crate or module. You can learn more about how Rust lets you write modular code in this chapter of the book. Many crates contain a prelude, a list of things that are convenient to import all at once. This allows common features of the module to be conveniently accessed without a lengthy prefix. For example, in this file we can use #[wasm_bindgen] only because it is brought into scope by the prelude. The asterisk at the end of this use indicates that everything inside the module wasm_bindgen::prelude (i.e. the module prelude inside the crate wasm_bindgen) can be referred to without prefixing it with wasm_bindgen::prelude. For example, #[wasm_bindgen] could also be written as #[wasm_bindgen::prelude::wasm_bindgen], although this is not recommended. We can see that the alert function requires a single parameter s of type &str, a string. In Rust, any string literal such as "Hello, test-wasm!" is of type &str. So, alert could be called by writing alert("Hello, test-wasm!");. If you are curious about the rest, read on. Either way, the contents of utils.rs define a single public function set_panic_hook. Because we are placing it inside the utils module, we will be able to call the function directly by writing utils::set_panic_hook(). We will discuss how and why to use this function in src/utils.rs. // When the `wee_alloc` feature is enabled, use `wee_alloc` as the global	// allocator. At compile time this will test if the wee_alloc feature is enabled for this compilation. If it's enabled we'll configure a global allocator (according to wee_alloc's docs), otherwise it'll compile to nothing. As we saw earlier, the default vector in [features] only contains "console_error_panic_hook" and not "wee_alloc". So, in this case, this block will be replaced by no code at all, and hence the default memory allocator will be used instead of wee_alloc. The purpose of utils.rs is to define the utils module, which contains a single function set_panic_hook. This function becomes part of the utils module in lib.rs, as described in the preceding section. If the console_error_panic_hook feature is not enabled, then set_panic_hook is defined to be an inlined empty function. So, there is no run-time performance or code-size penalty incurred by its use. // we will get better error messages if our code ever panics. Here, we define a function that's preceded by a cfg attribute. This attribue, #[cfg(feature = "console_error_panic_hook")], tells Rust to check if the console_error_panic_hook feature is set at compile time. If it is, it will call this function. If it isn't- it won't! The crate console_error_panic_hook allows debugging Rust panic messages in a web browser, making it much easier to debug WebAssembly code. After: "panicked at 'index out of bounds: the len is 3 but the index is 4', libcore/slice/mod.rs:2046:10"
Note though that console_error_panic_hook is not entirely automatic, so you'll need to make sure that utils::set_panic_hook() is called before any of our code runs (and it's safe to run set_panic_hook many times). For more details, see the console_error_panic_hook repository. WebAssembly code is frequently transmitted over the wire to users, so compiled code size is often important to ensure an application loads quickly and is responsive. wee_alloc is a tiny allocator designed for WebAssembly that has a (pre-compression) code-size footprint of only a single kilobyte. An analysis suggests that over half of the bare minimum WebAssembly memory footprint is required by Rust's default memory allocator. Yet, WebAssembly code often does not require a sophisticated allocator, since it often just requests a couple of large initial allocations. wee_alloc trades off size for speed. It has a tiny code-size footprint, but it is is not competitive in terms of performance with the default global allocator, for example. For even more details, see the wee_alloc repository, or general documentation about shrinking code size of WebAssembly binaries. web.rs is an integration test defined with Cargo that is intended to be run in a headless web browser via the wasm-pack test command. The #[wasm_bindgen_test] is like the normal Rust #[test] attribute, except it defines a test accessible to WebAssembly and headless web browser testing. Note: Eventually #[test] will work with WebAssembly as well! Currently though custom test frameworks are not stable. Here the pass function is a unit test which asserts that arithmetic works in WebAssembly like we'd expect everywhere else. If the test panics (such as the assert_eq! being false) then the test will fail, otherwise the test will succeed. The reference documentation for #[wasm_bindgen_test] should have more information about defining these tests. Like we saw earlier in src/lib.rs the * import pulls in everything from wasm_bindgen_test, notably the wasm_bindgen_test_configure macro and the wasm_bindgen_test attribute. The wasm_bindgen_test_configure macro (denoted by ending in !) is used to indicate that the test is intended to execute in a web browser as opposed to Node.js, which is the default. This statement means that the test is only intended for the wasm32 architecture, or the wasm32-unknown-unknown target. This enables cargo test to work in your project if the library is also being developed for other platforms by ensuring that these tests only execute in a web browser. We've written our code so now we need to build it. It'll generate a pkg folder with the wasm file, a JS wrapper file around the wasm, your README, and a package.json file. and we've now executed our first tests in a web browser! and similarly if you're developing a project for Node.js you can also execute wasm-pack test --nodejs to run tests in Node. Be sure to see the testing reference documentation for other supported features as well! This is everything you need to upload your code to npm! Let's do just that! Now normally if things are not scoped you can just do npm publish but if you give it a scope you'll need to tell npm that this is actually public so it can publish it. We need to do that here since we gave our packages a scope to avoid conflicting with each other! Next up is actually running the code and verifying we got it from npm and how we can use that code. This tool will ask you for the name of a project, and then create a directory with that name. The scaffolded project includes an example WebAssembly package, hello-wasm-pack, in your package.json. Go into the package.json file, add your package, and remove the hello-wasm-pack dependency from the "dependencies" section. Then in a web browser navigate to http://localhost:8080 and you should be greeted with an alert box that says "Hello World!". If you did congrats you've successfully uploaded your first bit of wasm code to npm and used it properly!